Finished their own, many collaborate to the parish one, creating sometimes very imaginative reinterpretations (like the underwater or the ice cribs) of the Nativity scene. Particularly characteristic in this period, are the living nativity scenes, like that of Bagaladi, Jonadi, Isola Capo Rizzuto or Altomonte. The theater scene prepared for the occasion transforms ordinary citizens in improvised actors who express their contribution to the depiction of everyday life in the period of the Nativity, impersonating shepherds and other characters. Another deeply felt tradition is “focare” or “focarine”. Big bonfires lit on Christmas Eve around which dance and sing until dawn. In Bisignano, a huge bonfire is lit on the night of 24th December and feeded all night with wood that young people have accumulated for days. 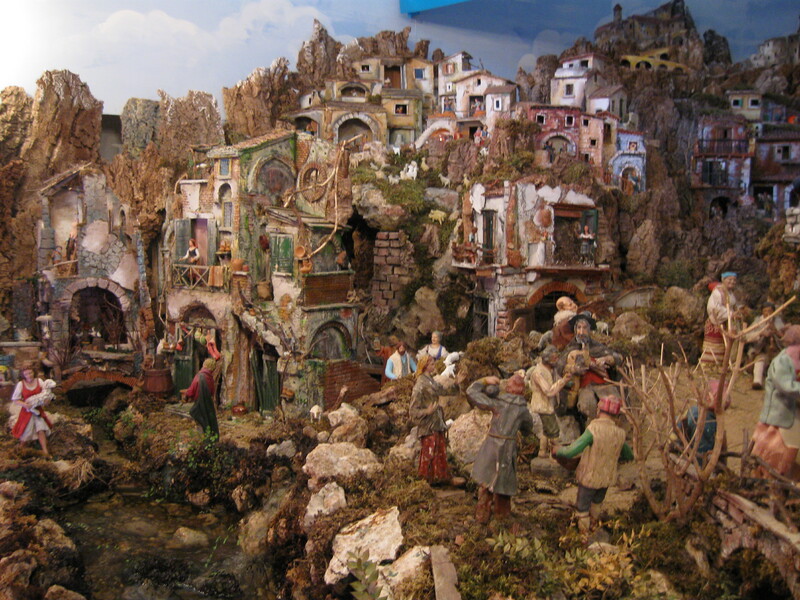 After the midnight mass the villagers gather around the focara to exchange greetings and to spend the night in the company, accompanied by folk music. Fire is the symbol of purification from original sin and is symbolically lit to burn all the bad that was in the past. The festive atmosphere is enlivened by bagpipers. The zampogna is the traditional instrument par excellence, still made with goat skin and rods worked by skilled craftsmen, often also skilled musicians. The players run through the streets of towns, in the early morning or evening, for every day of the novena, playing the lullaby and the melodies of Christmas folk songs. The songs are the classic “pastoral” or “strine” that animate the Calabrian villages. “Strina” is typical of Calabria tradition, although its distribution is limited to inland villages. In the past, the musicians used to go from house to house to bring the “good news” of Christ’s birth, getting paid and thanked with eggs, cheese, olive oil, wine and salami. Nowadays brigades of companions offer a serenade to relatives, friends or acquaintances to wish in dialect verse, good health, happiness and wealth. In exchange they receive food and wine gifts. The strina is usually accompanied by the sound of the ancient bronze tool used for “denting” the salt and guitars, mandolins, accordions and tambourines. In addition to the music, tradition requires that the Christmas Eve evening table have 13 dishes. Which is thought to be linked to the thirteen apostles. The table will then be left set: even after eating, the table is left with the food still in the plates waiting that “u bomminiallu” (Baby Jesus) eats it. Among the most curious traditions of Calabria we would like to mention two related to the night of the eve of Epiphany, considered a night of magical events. The first says that the girls, the night of the eve of Epiphany, before falling asleep, recite an auspicious song. If they dream of either a festive church or a flower garden will be for them a lucky year. The second legend says that on the eve of Epiphany animals can speak and have the power to curse their master. Therefore it is customary to make them eat well not to fall into their curses. Like every year, in a magical and waiting atmosphere, there are also the Christmas markets. The markets retain their authentic charm, selling handicrafts products and food and wine. Here we end the story of this fascinating region. Let’s go then to the next stop!